Pansage has a bright yellow torso, with bright green legs, a bright green tail, and a green and yellow head. He has a big broccoli-like piece on top of his head which is also bright green. He has black and white embroidered eyes and a black mouth and nose. 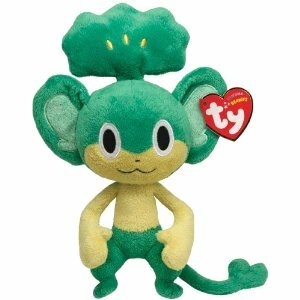 Pansage was released along with five other Pokemon Beanie Babies in October 2011, the others being Pikachu, Snivy, Oshawott, Axew and Tepig.